Home » Catalog » CSE Publications » Seminar Series » School autonomy: Are education systems doing their part? School autonomy: Are education systems doing their part? This paper is based on Dr Suggett’s 2015 publication ‘School autonomy: Necessary but not sufficient’, Evidence Base, Issue 1 2015, ANZSOG. The author first provides a context for education by considering autonomy in the broader field of public administration – policy trends, multiple definitions and models, and methodological challenges. She explores evidence from research on the pros and cons of school autonomy in schools and considers some of the implementation and design implications for systems. 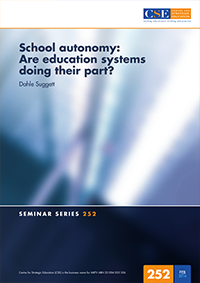 She concludes that a more rounded and nuanced perspective on system-design for autonomy is now needed in the education sector, with a theoretical underpinning and answers to questions of rationale, value, priorities, levers and expected outcomes.